“Tuanze Biashara” is Swahili for “Let's Start a Business”, a poverty alleviation project integrating a community radio station, social media, training workshops and a savings and loan association. See how this innovative micro-enterprise project is lifting people in eastern Kenya’s Tana River County out of poverty. In the Mid West, HCR works primarily with community radio stations and partners who rely on community radio for communication support. HCR has had dealings with the community radio broadcast sector over a number of years because we greatly support the role of community-run radio stations, such as the Mid West Aboriginal Media Association (Radio MAMA). Stations such as these are an important cultural and social asset in regional and remote areas. And so we are happy to offer our support to the sector in another way. Our own Ross James has been appointed to the assessor pool of the Community Broadcast Foundation. The assessors voluntarily commit some time to independently consider and provide advice on grant applications from community radio stations. Thanks go to Radio MAMA for sponsoring Ross in his appointment as their representative. (Cheeky note from Editor: The CBF announcement stated, “This talented bunch will start in their new roles on 1 July”. We note they didn’t mention Ross hee hee). Media research can cost thousands of dollars and many hours, or very little. It all depends on the question being asked and the data needed to answer that question. For example, HCR Associates have undertaken large scale surveys costing our partners thousands of dollars in Mongolia, Indonesia, West Papua and Pakistan. Then, there are the small-scale, low-cost studies such as that completed recently in Meekatharra in Western Australia for a community radio station. 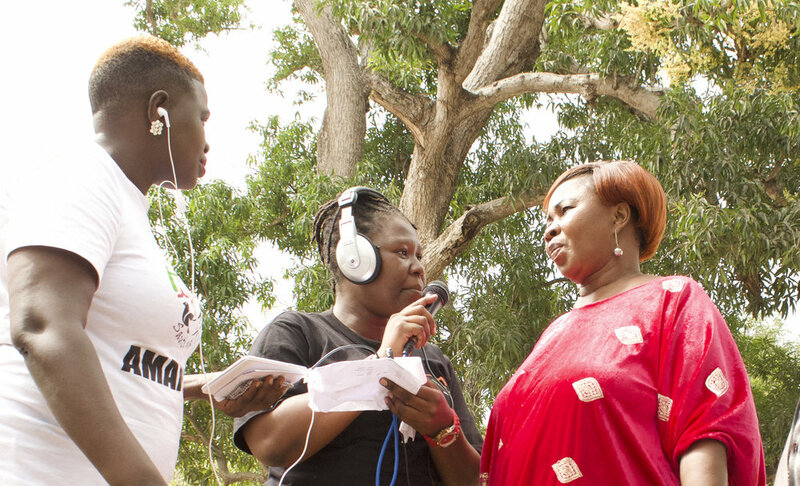 HCR has been supporting the struggling community radio station with non-financial support such as training, coaching, technical help and governance. Meeka FM 98.3 wants to build partnerships between the radio station and community organisations to promote health and well-being in the town. It’s on air profile is connecting the community. The town’s name, Meekatharra, is the Yamaji word for place of little water, off-putting to some, perhaps, but not enough to prevent the local government proudly promoting a town with golden prospects . The Meeka FM volunteers were becoming discouraged. What, they asked, were the golden prospects for Meeka FM in this place of little water? It seemed more like a place of little interest as far as the community radio station was concerned. Appeals for new members, offers of shout-outs or requests, any request for any response at all never resulted in a listener phoning, emailing or writing the radio station. The survey wanted to answer a simple question: did anyone listen? And so HCR constructed a 20-question interview of basic demographics, prompted and unprompted awareness of radio stations that could be heard in the town, basic patterns of listening to radio, a perception of what town issues concerned people, and what people had to say about Meeka FM—if anything. With no budget, we took advantage of the Meekatharra Festival on the weekend of 26-27 September 2015 when adults could be recruited at various events through convenience sampling. Five interviewers from Perth, a day’s drive away, volunteered to spend the weekend in Meekatharra, as long as they could have time off to watch the Aussie rules football preliminary finals broadcast on late afternoon television! The temperatures, it must be reported, were 31-33 degrees Celsius over both interviewing days, earning the locals’ admiration for dedication! We found out three of every four people mentioned Meeka FM (without being prompted by mentioning names of radio stations); those who listened liked the music; peak listening time was 10.30 AM to 2.30 PM. The survey gave station volunteers lots of ideas to change the way they engage with the community and promote the radio station, as well as strategies for programming. What we all came to value, however, is what we learned. We learned a tiny little radio station in a remote township could conduct a small survey at little cost with few people and still get basic but reliable information. As long as the sample is recruited randomly and reflects the broad profile of the community and the target audience we can be confident of the data. We learned that far from being disinterested in Meeka FM, the community wanted to talk to the radio station, just not in the way the station expected. The station had to go to them and not expect the community to come to the station. We learned that a relationship with the listeners in the Meekatharra community was to be valued as a one-to-one relationship, not mediated through the ubiquitous and impersonal technology that radio stations are inclined to use because, well, “That’s what we do in radio”. We learned community-level perspectives were being expressed that could well be relevant for future mobilisation strategies leaning on social capital and social ecology frameworks to, for example, highlight the central idea of “many of us think (such and such) so what can we do about it?” Prior to this survey, it was easy to buy into the counter-approach of government and nongovernment agencies that argued for more money, more specialists, more interventions. It was not so long ago that a small group of Meekatharra women took the initiative to organise a protest march against domestic violence. Participation was high as was a palpable sense of pride in having organised something for themselves, not by an outside service provider. We learned that the community regarded the tiny radio station as a valuable asset, connected to the community they called home despite the challenges of remote living. The radio station just hadn’t asked the right questions in the right way before. We learned that Meeka FM had a role in supporting social cohesion and social capital in Meekatharra if strategically carried out. Based on months of no response from listeners, Meekatharra seemed like a place of little interest as far as the community radio station was concerned. But, after this simple little survey, the radio station now knows a lot about its audience and even more about itself. Meeka FM is encouraged and motivated to pursue the goal of connecting the community in a town with golden prospects. This is a summary of a full blog submitted by Health Communication Resources to the Communication Initiative Policy Blogs. Meekatharra is a major supply centre for the pastoral and gold mining area in the Murchison region of Western Australia, is located about a day’s drive north-east of Perth, and is a key re-fueling and re-provisioning point for tourists and freight trucks travelling the route of hundreds of kilometres through isolated country to the major iron ore mining region of the Pilbara. While HCR's partner in Kenya works hard to obtain a community radio licence for the conflict-torn Tana River, the team on the ground have been continuing the work we began in June by meeting community groups, lobbying local government and vociferously advocating to bring pressure for the release of a licence. In a touch of amazing ingenuity, the Tana FM team were invited to have a stand to celebrate World Food Day (WFD) in the Tana River capital, Hola, recently.